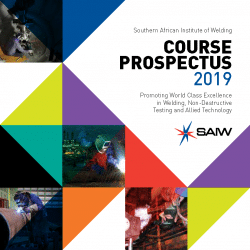 The Southern African Institute of Welding (SAIW) is a non-profit technical organisation dedicated to furthering standards in welding-fabrication and related technologies. Established in 1948, it is a founder member of the International Institute of Welding (IIW). 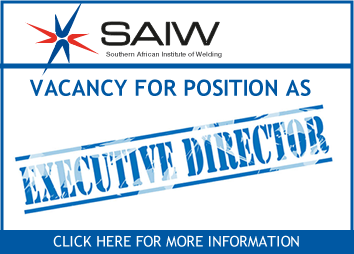 SAIW provides training programmes, consultancy and industry support services. Based in Johannesburg, with branches in Cape Town and Durban, we are active throughout Southern African and also have experience further afield – predominantly in Central Africa, the Indian Ocean Islands and the United Arab Emirates. SAIW has offered training courses for more than 30 years. An SAIW qualification has long been regarded as the industry standard in South Africa and also enjoys international recognition. An Authorised National Body (ANB) of IIW since 2003, SAIW offers the full range of IIW qualifications – Engineer, Technologist, Specialist, Practitioner, Welder and Inspector. We also have strong affiliations with leading training organisations such as the Universities of the Witwatersrand and Pretoria. In 2008, SAIW became an IIW Authorised National Body for Company Certification (the first outside Europe), enabling implementation of the IIW Manufacturer Certification Scheme. In terms of the Scheme, welding and fabrication companies are certified for compliance to ISO 3834 (Quality Requirements for Welding). 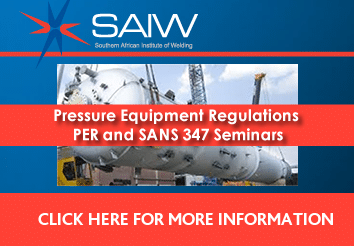 SAIW administers personnel certification programmes for a number of inspection activities including Non Destructive Testing (NDT) and South African regulatory categories of pressure vessel inspectors. Certification programmes are based on the ISO 17024 standard (General Requirements for Bodies Operating Certification of Persons). We are accredited for these activities by SANAS, South African member of the International Accreditation Forum. In 2005, SAIW formed SAIW Certification, a separate Section 21 not-for-profit company, to administer examinations and certification programmes. The separation of these activities is in line with international best practice. Appointed a Regional Designated Centre for NDT by AFRA, the African Regional Cooperation Agreement affiliate of the International Atomic Energy Agency (IAEA), SAIW conducts training for IAEA-funded fellows and takes a lead in regional scientific cooperation to promote self-sufficiency in the field of nuclear science and technology. Other SAIW activities include hosting workshops, seminars and conferences, the latter including IIW regional assemblies.